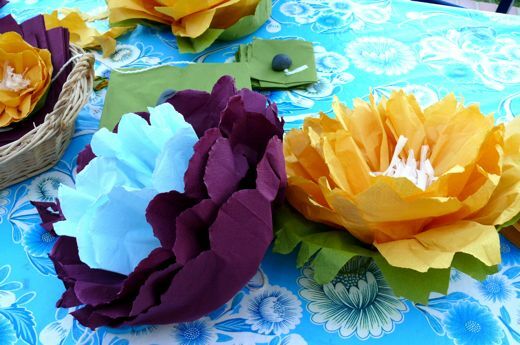 Evidently Ikea napkins last through two flower power parties, and there's still enough for more! 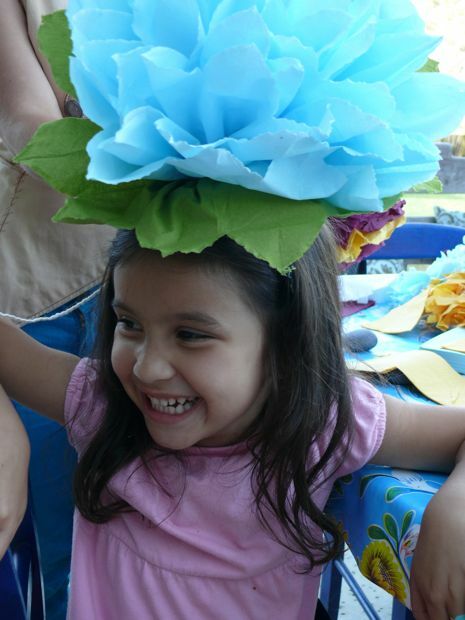 After Maria and I had our first flower making party, we knew we just had to share the fun. 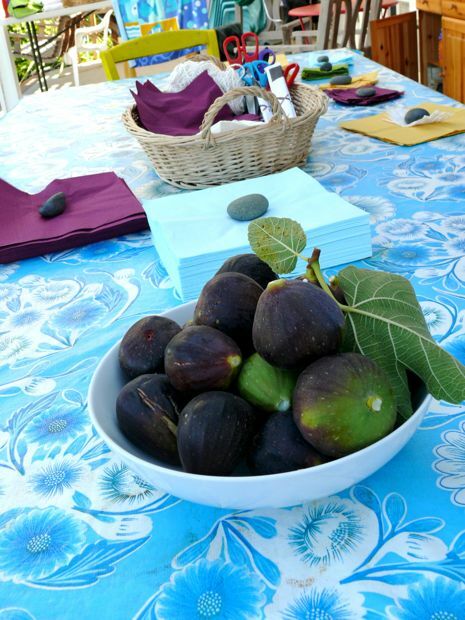 The figs and napkins are abundant here at the Bird House. 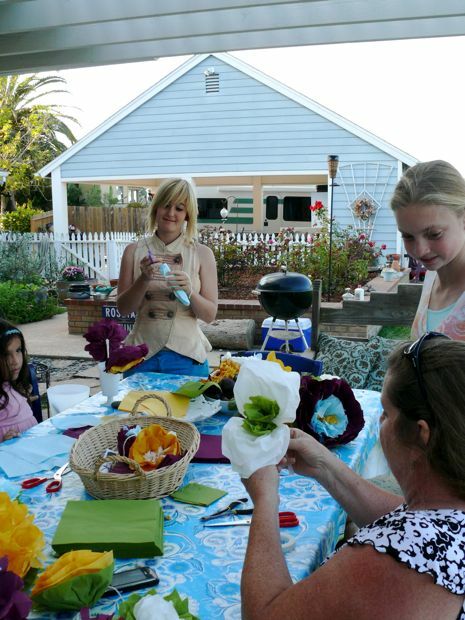 Maria and I wiped down the big table outside, and put out our floral supplies. Then she and I broke out a box of Trader Joe's pie crust, and some of their raspberry, and apricot jams. We are working on our technique, and the second batch was less explosive! 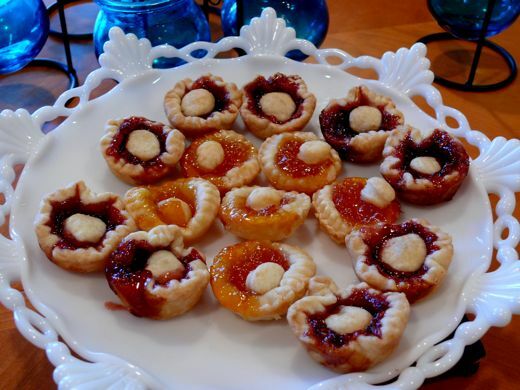 Looks aside, cut out pie crust filled with jam = yummy treat. And as Maria noted, they were "very good for a flower party with ladies." Of course gentlemen were more than welcome. But on this occasion we attracted only ladies... a fun bunch of artistic florist ladies. And may I add: Maria and I enjoyed this activity the first time, but shared with more friends, it was like a hundred times more awesome. We were laughing, and admiring, oohing and ahhing over every new variety and creation. And we kept getting wonderful ideas for where we should display our sweet skills and blossoms. Suki created a garden bed's worth of blooms... all lovely and bodacious. Every time someone tried a new color, or color combination, or cut, or size, we would get happy and excited all over again. Every variety was pretty and inspiring. Inspiring glamorous humor, and whimsical play. Olivia made some of the smallest and most elaborate flowers. She's patient that way. 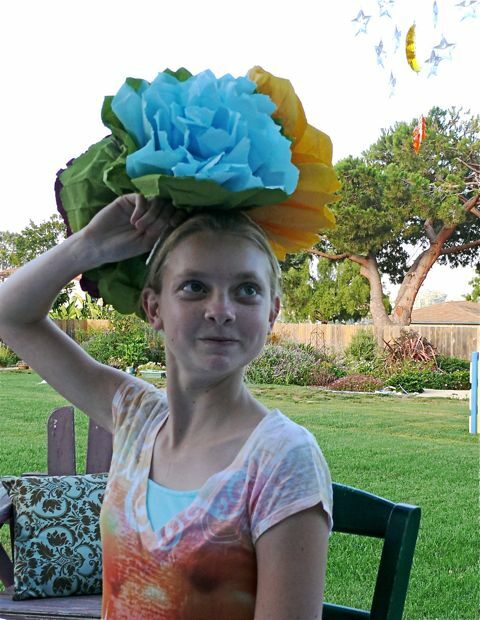 But these big blooms beg to be worn like a hat. Sandy made flowers of every size, even orchids. I want to try my hand at the cut chrysanthemum she created. Yup, it all adds up. Oh, but those mini pies didn't last as long as the napkins! How cute! Looks like such big fun! Pretty, yummy pastry treats---I see nothing unlovely about the overflow of juices....perhaps even more tempting that way! 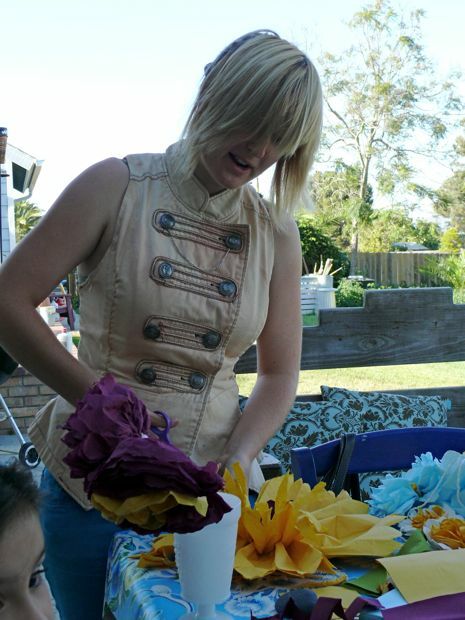 Love the flower party pictures. Wow! Everything looks so pretty. Where did you find the napkins in all those colors?